Who is this Gibraltar based casino? We introduce the Wink Slots Casino brand to show you how they fare in terms of their games, software, banking, customer service and more. Wink Slots Casino may be brand new to the industry but they fall under Cassava Enterprises who form part of the 888 group of casinos, and they've been around for quite some time. As such, we can surely expect great things from Wink Slots in the near and distant future. Despite their lack of experience, they are already making some big waves with their great gaming offers and an endless list of special promotions. Their focus currently lies on Bingo and slot games and you'll be happy to know that there are over 500 of those available. That doesn't mean that those are all they offer though, the casino games list may be limited but you'll still find some of your favourites among them. Wink Slots Casino is based in Gibraltar and as you can expect, acquired their gaming licenses from the Gaming Authorities in Gibraltar as well as the UK. This allows them to trade in various countries all around the world with the exclusion of US, Israel and Turkey. Thus far they only support English on their site and supported currencies include US Dollar, British Pound and Euro. Wink Slots Casino games has some incredible titles at their disposal and these can only come from highly reputable software developers. Being part of the 888 Casino Group, they also have access to the in-house development wing called 888 Gaming but they have also employed the services of other well known developers such as Bally Technologies, NetEnt, OpenBet, SkillonNet, IGT and WMS. These companies are all considered to be industry leaders and between them they have decade's worth of experience in developing top notch casino games. NetEnt especially is considered to be a front runner for the absolute best software developer in the casino industry and with their unique gameplay mechanics and amazing graphics, it's easy to see why. As already mentioned, Wink Slots Casino has over 500 slot games at their disposal which should be plenty for any casino goer. Keeping in mind the list of software developers at work here, you can also be sure that none of those games will be half efforts, but only the best will be allowed. When opening the slot games page, you'll find them sorted neatly in to various categories including All Games, New, Popular, Wink's Picks and Play for Free. There's also a search option if you are looking for a specific slot game. These are some of the fan favorite slot games to look out for: Starburst, Gonzo's Quest, Rainbow Riches, Guns N' Roses and Dazzle Me. In addition to the vast number of slot games, there's also a good few casino and table games available. For those players who enjoy some company during their game time will be happy to note that Wink Slots Casino also hosts a fair number of live casino games among which you'll find several versions of Roulette, Blackjack and Poker. While the table games and live casino games cannot be played for free, there are a number of slot games that may be tried without risking any of your funds. If you are hesitant to start playing then why not try some of these games and get used to the environment first. It's also important to note that most of the games at Wink Slots Casino are available to play online as well as on most mobile devices and may be downloaded through the various app stores. Being relatively to the industry, it's difficult to judge just how good the support at Wink Slots Casino is. The lack of experience is definitely a concern but then again experience can only come with more time. However, being part of the 888 Casino Group, they should have access to great resources in terms of customer service and thus we'll be expecting nothing less than perfection here. Their site does specify that queries should be answered within 72 hours which is a bit slow in our opinion although it's possible they only state three days for extreme situations. For any initial queries players should head over to the FAQ section that includes information on some of the most common questions such as how to claim free spins vouchers, how to initiate a withdrawal, are payment details secured, further information regarding support. This is not the most comprehensive FAQ section we've come across, in fact there are many big points missing that should make the support experience at Wink Slots Casino much better. If your answer still remains unanswered then there is always phone and email support. From the support page it's stated that email queries should be answered within 4 hours which doesn't coincide with the 72 hours stated on the FAQ but is much more in line for what we'd expect from a partner in the 888 Casino Group. There is also a toll free support line that is available 24/7. While the 24 hour phone support is a great addition, a live chat feature is also an additional option to get in touch. It's always important for a casino to have enough available games to ensure their players don't get bored after a while but it's even more important for their players to feel appreciated by being awarded with special offerings from time to time. Wink Slots Casino has taken this to heart and put together some great bonus offerings for new and existing players. Register with Wink Slots Casino and you could walk away with £600 in welcome bonus funds as well as 80 free spins. All that is needed is for players to register a new account and make that first deposit. Minimum amounts for a first deposit are required to be at least £20 in order to qualify for the bonus and will award players with 100% their deposit up to an amount of £400. The first deposit will also issue 50 free spins. The welcome bonus continues over a second and third deposit which provides another 50% deposit bonus, this time only up to £100 as well as 15 free spins with each deposit. Once again the minimum amount needed is £20. The free spins are only to be used on certain games as specified by Wink Slots Casino and are valid for a total of 7 days before they expire. Free spin winnings are capped at between £1 and £13 for the first 50 free spins awarded and £4.5 for the last 30. It's important to remember that in order to request a withdrawal of the free spin winnings, a wagering requirement of 30 times the winnings need to be met first. A 30x wagering requirement isn't the lowest we've seen but it's still below the norm. We all hate Mondays but Wink Slots Casino is doing their part to make the start of your week just a little bit better. Any deposits made on Monday will qualify the player for a 50% deposit bonus. Minimum amounts required at £20 and the bonus amount goes up to £50. While this isn't as great as the welcome bonus, it's still more than enough to get you excited for each new week. This promotion is available all day, every Monday and players will need to use the promotional code "MONDAY" when making their deposits. Once again a 30x wagering requirement applies before a withdrawal may be made. Weekends are time for fun and games and Wink Slots Casino want to help you enjoy your free time as much as possible. As such they've seen fit to include a few more deposit bonuses that only apply on weekends but will run until 23:59 on Sunday evening. Using the bonus code "WEEK25" your first deposit of the weekend will award you with a £5 bonus. A second deposit may receive another bonus, this time being £15 when using the bonus code "WEEK65". And finally, the third and most lucrative bonus is rewarded when using the code "WEEK150" and will reward players with an additional £50. Once again, minimum amounts apply for these deposits and these are £20 for the first deposit, £50 for the second and £100 for the third. Please note that this bonus only runs on Saturdays and Sundays, Fridays are not included. 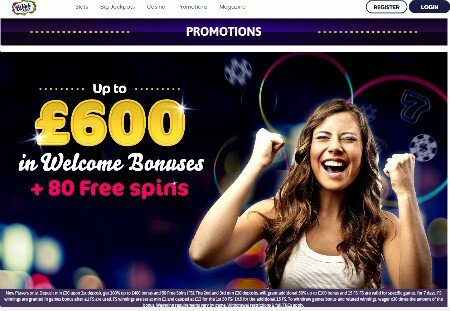 Wink Slots Casino really appreciates their players, especially those who support them for longer periods and as such they've included the Loyalty Celebration into their bonus offers. This is yet another deposit bonus which awards players for making many deposits over however long a period is needed. Loyalty Celebration will reward long standing players when making a 10th, 15th and 20th deposit into their accounts. General bonus policies will apply as usual and withdrawals will again be subject to a 30x wager requirement. The theme used by Wink Slots Casino is a simple yet elegant one. The site mostly uses a plain white background to draw attention to the offerings on the page. 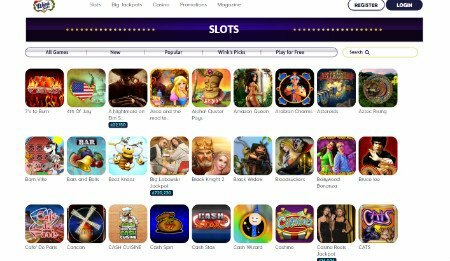 Right at the top of the page, you'll find the navigation bar, giving you access to pages such as slot games, casino games, jackpot games and promotions. There's also a big Join Now and Sign Up button to the right of this bar. The middle of the page is dedicated to displaying games or promotions and the large tiles utilized makes it easy to identify each item. The design may seem plain but with the various graphics, including the colourful company logo, there's enough variety to keep things interesting and that's what makes the site look so good. The layout is also great and should be easy to navigate, even for new visitors. The games pages are just as user friendly, with smaller tiles to fit all the game offerings. The games are neatly divided into various sections to make it easier to locate the ones you're looking for. There is also a search option in case you're looking for something specific. Winks Slots Casino have added a number of payment methods to add convenience to your experience with them. While a few options are notably missing, the inclusion of a phone payment option is pretty good. The available payment options are phone payments, Visa, Maestro, PaysafeCard, Paypal, Entropay and bank transfer. All of these methods are available for deposits and most for withdrawals with the exception of Entropay, PaysafeCard and Mastercard. If deposits were made using one of those methods then withdrawals will be submitted via bank transfer. Withdrawals may vary between £20 as minimum and a maximum of £1,000 per day. There is also a weekly and monthly limit of £3,000 and £5,000 respectively. Most deposits should reflect instantly with the exception of bank transfer which may take 5-8 business days to process. Similar limits are imposed on withdrawals with the minimum being £10. The maximum limit is £1000 per day, £2000 per week and £3000 per month. There is a 48 period after a withdrawal is requesting during which it is evaluated before being processed from there card payments take another 5 days, wire transfers 4-7 days and other payments, 2-3 days. Cassava Enterprises has given us a shiny gem in the form of Wink Slots Casino who are off to a rather good start. Being a new company in this industry can be very intimidating but having the backing of someone like the 888 Group definitely helps to get things into place. Thus far we are mightily impressed with the slot and casino games available at Wink Slots. The slot selection alone is staggering and there are some great casino and live casino games to be enjoyed. While the casino games selection could be a little more expansive, all the major games are there. It's still difficult to determine the level of customer support on offer but the inclusion FAQ section is a good foundation to build on. Their inclusion of email and phone support is great but a live support options should also be available as that is generally how players choose to contact support teams. They also have a good number of payment options available and processing times are acceptable. While there's some room for growth, Wink Slots Casino has plenty to offer their players and we suspect they'll continue to grow as time moves on.